Following on from my previous posts on fur coats (see here) & parkas (click here) I'm looking at another great classic today the camel coat. Not only is it a colour that goes with so many neutrals in your wardrobe - winter whites, denim, black, navy, grey & red but it always adds an element of elegance & chicness to any outfit. I love a camel coat thrown over a pair of jeans & don't think there's anything more gorgeous when teamed with a simple white shirt & some leopard print ballet pumps. The only problem is that there are so many styles to choose from you're spoilt for choice. Now last year I brought a three quarter length single breasted camel coat from Zara but that doesn't mean I'm not hankering after another coat to add to the collection! So here's my edit of the best camel coats currently on the high street. Starting with this gorgeous belted one from Mango. I love this style but if you're like me & not comfortable with a belted coat but love the style you can always wear it either undone with the belt untied (after all if you're like me you'll very rarely do your coat up anyway!) or to give a bit more shape & definition tie the belt at the back. I love how Mango have styled the coat with the rolled up casual fit grey trousers & trainers. Next up is this oversized coat from ASOS, similar in style but minus the belt. Again it's been styled with trainers but this time with a skirt & whilst I haven't yet embraced the full on trainer trend both these pictures are seriously tempting me!! Or if the above coat looks too oversized then this ASOS cocoon coat looks a great alternative. Or even this one from Topshop. 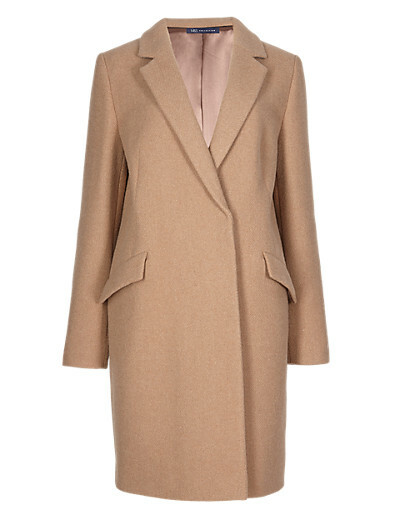 Moving onto a more tailored style next with this classic double breasted coat from Mango. Or this single breasted one from M&S, which is a little similar to the one I brought last year. Or how about this one from Zara? Or what about this one from Massimo Dutti. More expensive than the rest but the quality, cut & style are bound to be fantastic. Or for a slightly more casual feel perfect for the school run then you won't go wrong with this double breasted pea coat. But if you love the style of a mac but need something a bit warmer for winter then this coat from Mango would be perfect. Keeping with a more casual feel & this shorter coat from Mango would look fab teamed with a large scarf. Or how about this waterfall style from Next? And finally there's this collarless blanket coat from Topshop. Love the black piping & detailing. I think this would look stunning teamed with some black cigarette pants & ballet pumps. Finishing with what I'm wearing today. So what do you think are you a camel coat kind of girl?! 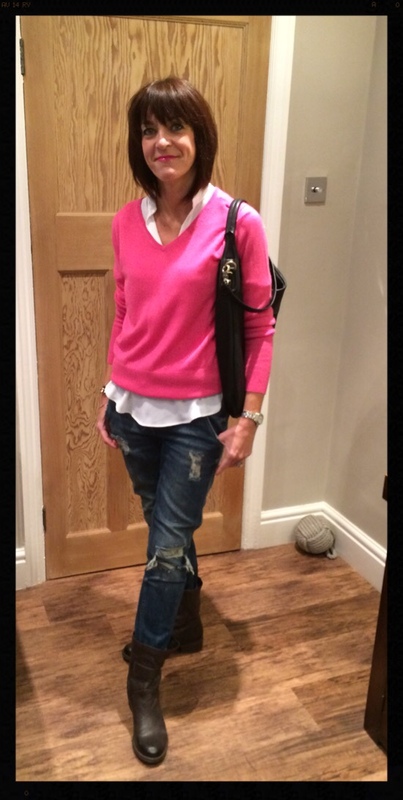 Do you have a favourite from my pick of the high street? I think I'm leaning towards the ASOS Pea Coat & the M&S Wool Blend Flap Pocket coat but if I'm honest I wouldn't mind one in each style! How about you, I'd love to hear which you'd pick! Enjoy your Sunday & just in case you haven't got discount code overload Wallis have 25% off everything for 25 hours click here to shop! Should I shouldn't I?!!! I find my navy satin edge blouse sooo useful that the white version would also be a great multi-tasker & as for the oversized shirt this would be perfect for wearing with my faux leather leggings & as for the grey shirt - *sighs* I just love the detailing......oooh to be good or not to be good that seems the burning question for today!!! And I haven't even yet looked at Boden (15% off everything plus free delivery & returns use code J9G7) or Marks & Spencer (20% off clothes, home & beauty with code OCTEM14)!! Right I'm off to catch up on Strictly, sequin heaven here I come!! See you in the morning. Oooh I adore the ASOS oversized one but still have my Zara camel one from last year! It's gorgeous isn't it Joanna.....how many camel coats is too many though?!!! You look so lovely in that bright pink, Jane! 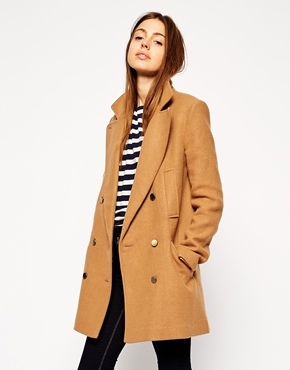 I like all your choices for camel coats, but my favorites are both of the coats from Asos, as well as the double-breasted one from Mango. Speaking of Mango, I have not ordered from them, so I'm curious to know how the quality of the clothing is, as well as how the sizing runs. Do you find their clothing to be true to the size charts? Melissa I'd say Mango are on a par with Zara size & quality wise. They seem to have really raised their game in the last 12 months in particular & have some great regular discount weekends. Hope you're having a fab weekend. I was looking for a camel coat last year but never found a style to suit me! Great selection here Jane:) Hope you are enjoying the weekend! Are you still on the lookout this year Anne or have you given up? It's so frustrating when you know that you want but can't find exactly what you're looking for. Yes we've had a fab weekend thanks & two more days left :-) Hope you've had a good one too. They're both gorgeous aren't they Helen?! That's the trouble isn't is Sharron, camel coats are such classics that you could so easily have several in different styles in your wardrobe. They're all fab aren't they Emma?! The trouble is there's sooo many gorgeous ones to choose from!! LOVE a camel coat - casual or fancy-fied, it's a must have. Nice examples and paired with a bright pink jumper - yes thanks you! Did you know that Jaeger invented the camel coat? No I didn't know that Anmarie & I've not worn my camel coat with hot pink so must definitely give that a try.